Our highly trained surgeon, Dr. Jamie Gottlieb, will have a thorough conversation about all our treatment options. Surgery is not recommended for every patient and usually is reserved for patients that have exhausted all other forms of treatment. If non-surgical treatments have failed or not progressed as planned, surgery can be arranged with Dr. Gottlieb and his team. Some of our most common procedures for outpatient spine surgery in Mishawaka are listed below. Click the procedure name to open a PDF document in a new window. This surgery is where the disc(s) in the cervical region (neck) are removed which will release the pressure on the nerves in the spine. The disc space is then filled with bone graft which will help the vertebrae grow into one solid unit. This fusion will help keep the shape and form as well as provide space and room for the nerve roots and spinal cord. The usual length of stay in the hospital for decompression and spine fusion surgery varies from one to three days. More than likely a cervical collar will be worn post-operatively. middle portion of your lower back. 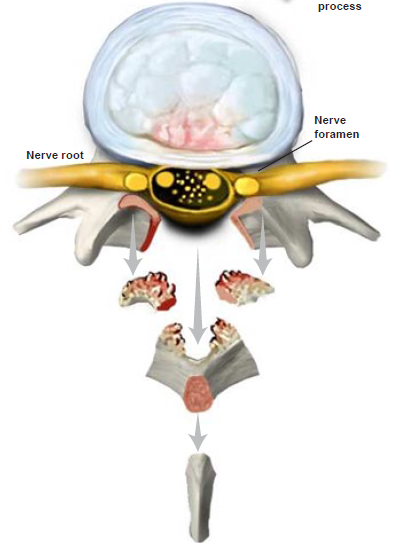 The surgeon removes the lamina (the portion of the vertebra that covers the nerve roots). 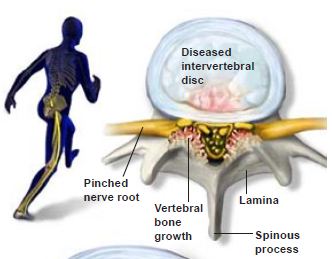 Removing the damaged lamina opens up the spinal canal, taking pressure off the nerves. pressing on the nerve roots. The spinal canal is now clear of any bone fragments, which relieves pressure from the nerve roots. The surgeon checks the nerve roots to make sure they are no longer being pinched. The usual length of stay for a lumbar discectomy is 1-2 days depending on the patient’s medical condition and length of surgery. This may also be done on an outpatient basis as deemed by the surgeon. Lumbar Discectomy is removal of a disc in a specific level in the lumbar spine. By using a microscope and other instruments, surgeons are able to minimize the incision size which will increase healing time. Once the disc is removed, the nerves are no longer compressed or under pressure and can relieve the pain and numbness felt by the patients. damaged portion of the disc is removed, leaving any healthy disc material to perform its function as a cushion between the vertebrae. 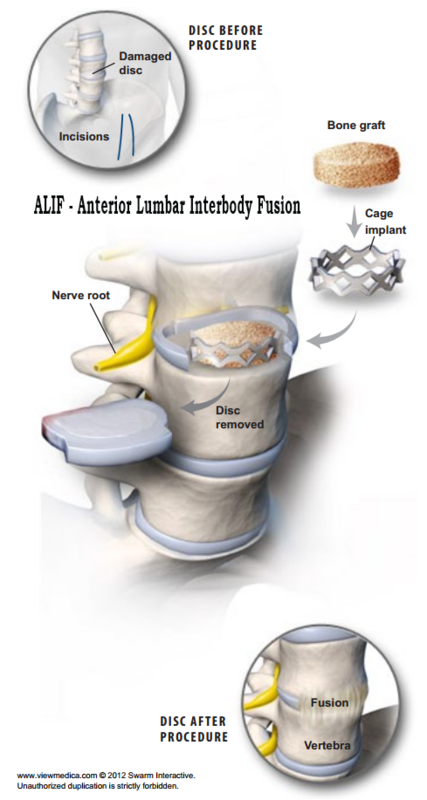 Lumbar Fusion is a procedure where 2 or more vertebrae are fused together using bone graft and implants, rods, and screws which will eventually lead to one solid bone. The advanced technologies used can help eliminate pain by stopping abnormal movement and stabilize the spine. There are different approaches (anterior, lateral, and posterior) that are used separately or combined based on the anatomy of the disease and individualized patient evaluation. The procedure is performed through a three- to five-inch incision on the stomach. Two common approaches are over the center of the stomach or slightly to the side. A metal cage implant filled with bone graft is placed in the empty disc space. This realigns the vertebral bones, lifting pressure from pinched nerve roots. In some patients, this will be enough to secure the vertebrae. For others, the surgeon may need to implant a series of screws and rods along the back of the spine for additional support. Over time, the bone graft will grow through and around the implants, forming a bone bridge that connects the vertebra above and below. This solid bone bridge is called a fusion. caused by degenerative disc disease. It can be performed on an outpatient basis. Usual length of stay is 5-10 days in the hospital depending on the amount of levels fused and patient’s other medical conditions. A brace will worn by the patients post-surgery for a time determined by your surgeon. Kyphoplasty is a procedure to stabilize vertebral fractures. A device is used to open the space and a cement-like material is implanted to support and stabilize the damaged vertebrae. Through a half-inch incision, small instruments are placed into the fractured vertebral body to create a working channel. The KyphX® Inflatable Bone Tamp (IBT) is then placed into the fracture. The device is carefully inflated, creating a cavity inside the vertebral body. The balloon is deflated, leaving a cavity in the vertebral body. The cavity is filled with bone cement to stabilize the fracture. Once filled, the incision is closed. With the process completed, an “internal cast” is now in place. This stabilizes the vertebral body and provides rapid mobility and pain relief. It also restores vertebral body height, reducing spinal deformity. Usually this is done as an outpatient procedure although there may be circumstances that would lead to a 1-3 night stay based on patient’s medical condition. Spinal Cord Stimulator Insertion- A spinal cord stimulator is a device used to send electrical currents to the nerves in the spine to interfere with the nerve impulses that feel pain. This procedure is set up in two phases where a trial is used to ensure it works appropriately and adequately. Once the trial is over, a permanent stimulator is inserted. These are most commonly used for chronic pain patients. include people who suffer from neuropathic pain and for whom conservative treatments have failed. patient’s pain. The leads are connected to an external trial stimulator, which will be used for approximately one week to determine if SCS will help the patient. This procedure is usually done as an outpatient going home the same day. There may be times that a patient will stay overnight based on the patient’s medical conditions or special circumstances.